Water is essential to life. However there are large regions in North America where this precious commodity has always been scarce. On top of that, human land uses and climate change have exacerbated water shortages in many more areas. Not only does this pose problems for people and agriculture, but it also threatens the natural order and is pushing many species to extinction, including salmon. In the West, the words “Water Rights” have a deep and powerful meaning. Many battles, both legal and physical, have been fought and continue to be fought over these two words. Fortunately, beavers are able to help us with this serious situation, and they do it for free. By building dams and impounding water in the upper reaches of most streams, beavers can have a significant impact on water availability in arid locations throughout the year. 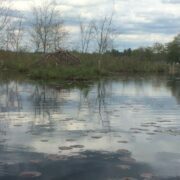 During high flow periods, such as spring snow melt or heavy storms, beaver dams retain some of the water. Then rather than flowing quickly away, this retained water is slowly released through inherent leaks in the dam and from springs from the recharged aquifer. In fact, the volume of water stored in the ground is much greater than the beaver pond itself. All this stored water helps to maintain downstream flows throughout the year, especially during the dry season when the water is needed the most. Beaver dams normalize stream flows by decreasing maximum flows and increasing dry season flows. This has clear benefits both to man and in the environment. Concerned about water availability in your area? Join the Beaver Bandwagon and advocate to restore beavers throughout their native range!